Hi there! 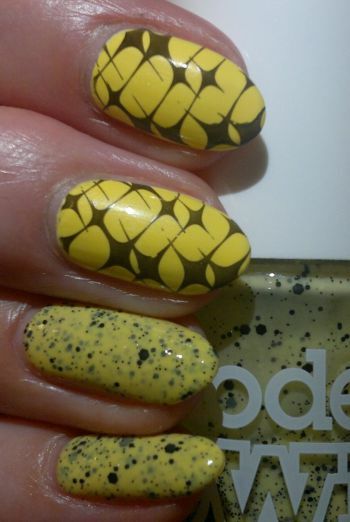 This is another mani that I’m doing for the 31 Day Nail Art Challenge (which I’m doing for the 2nd time and on my own terms). This is mani is for challenge #3 YELLOW NAILS. For this easy mani I painted my pinkies and ring fingers with 4 (!) coats of Models Own Goose. I painted my thumbs, index and middle fingers with 2 coats of white polish, and then 2 coats of Rimmel 60 Seconds 507 Round And Round In Circles. I used Pueen‘s 61 plate (which is part of Pueen‘s Stamping Buffet collection) and the one and only Revlon Colorstay 270 Stiletto. Hi there! 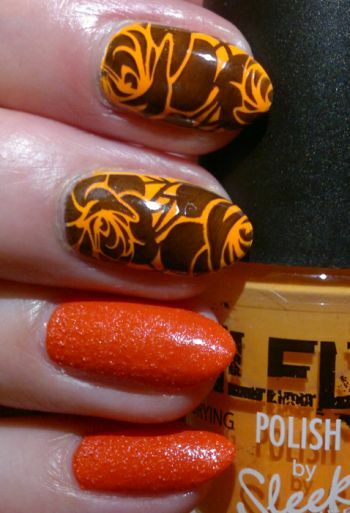 Today’s post is about the second mani I did for the 31 Day Nail Art Challenge – it’s challenge #2 ORANGE NAILS. For this mani I painted my nails with Sally Hansen Sugar Coat 260 Candy Corn (3 coats, pinkies, ring fingers) and with Sleek‘s Quick Drying Polish 22 Florida (2 coats over a white base, middle and index fingers, thumbs). I needed a white base because Sleek’s orange polish isn’t of great quality. It’s incredibly thin, and I doubt that even 4 coats would have been enough. I also found that this polish took ages to dry. Yikes! It’s obvious why Sleek discontinued this nail polish collection! The stamping plate I used is the my trusted unbranded Flowers 02 plate. The black polish I stamped with is Revlon Colorstay 270 Stiletto. For this mani I painted my nails with Revlon Colorstay 290 Midnight (2 coats). I love this polish (I love quite a few Revlon Colorstay polishes because they’re awesome). I used my (relatively new) MoYou London Animals 05 plate – which I bought because it has a number of marine images. I own several stamping plates with marine images, and I’ve done quite a few marine manis over the years – and I know I’ll be doing many more! 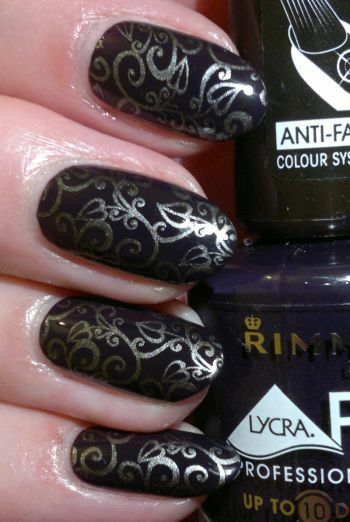 For this mani I painted my nails with Rimmel Lycra Pro 416 Night Flight (2 coats). 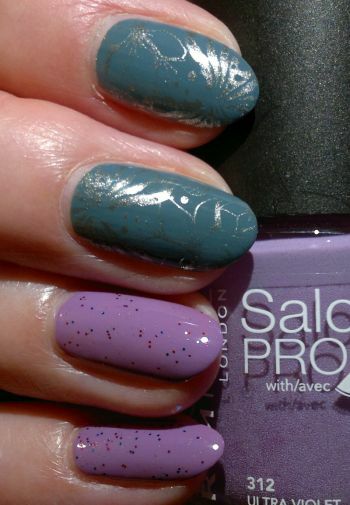 I love everything about this polish – the colour is gorgeous, the polish dries reasonably quickly, and it doesn’t stain. Great stuff! I went for a quick and easy to do mani. For the images I used Pueen‘s 76 plate (which is part of Pueen‘s Buffet Leisure stamping plate collection) and Sally Hansen Insta-Dri Presto Pewter. I really liked this mani. The two colours look great together, and the images transferred very well. For this mani I painted my nails with Rimmel Lasting Finish Pro 370 Wild Orchid (middle and index fingers, thumbs, 2 coats). For the images I used Pueen‘s 114 plate (which is part of Pueen‘s Make Your Day collection), Rimmel 60 Seconds 820 Hot Black To Go and Sally Hansen Complete Salon Manicure 819 Coat Of Arms. I liked this mani a lot. I’ve rediscovered textured polishes, and I love purple nails with black and gold accents. 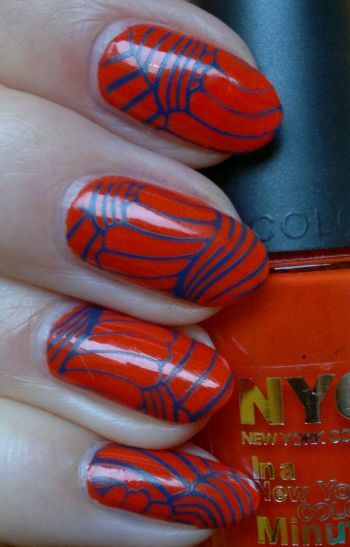 And this mani has both! What colour nail polish are you wearing at the moment? Feel free to get in touch via the comments. And thanks for stopping by! This time I decided to stamp, and I opted for the seashell pattern from Pueen‘s 96 plate (which is part of Pueen‘s Buffet Leisure stamping plate collection). The blue polish I stamped with is Essence Colour Boost 11 Instant Match. Hi there! This post is about a mani I did a few weeks ago. For this mani I painted my nails with Rimmel Lycra Pro 431 Stormy Skies (1 coat, middle and index fingers, thumbs) and Rimmel Salon Pro 312 Ultra Violet (2 coats, pinkies, ring fingers). 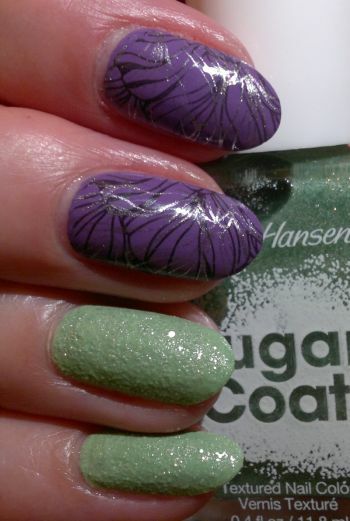 I used Miss Sporty Sparkle Touch 889 to add a touch of glitter to the purple nails. 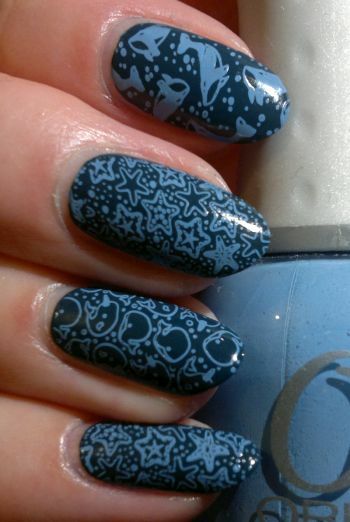 For the images on the blue(ish) nails I used Pueen‘s 99 plate (which is part of Pueen‘s Make Your Day stamping plate collection). The golden polish I stamped with is the sensational Sally Hansen Complete Salon Manicure 819 Coat Of Arms.